The annual Free Thinking Festival, run in conjunction with BBC Radio 3, is now a firmly established event in Sage Gateshead's calendar and attracts a diversity of visitors eager to discover, explore and open up their minds to a variety of observations on the 21st century and how it has changed our lives. Social media, gender issues and so much more. Visit the Sage Gateshead website for more information on what it's all about. Intriguing as all this was, the main interest for the BSH team was the live broadcast of Jazz Record Requests presented, as always, by Alyn Shipton. 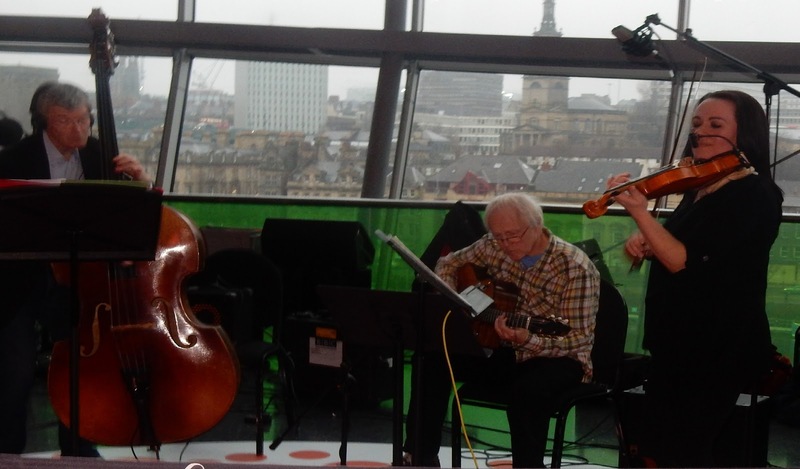 Alyn also laid down his credentials, not just as a broadcaster, but as a jazz musician by bookending the program with a live trio session by Emma Fisk (violin); James Birkett (guitar) and himself on double bass. PS: Tomorrow morning (March 11) Sarah Walker talks to saxophonist and composer Tim Garland. The program runs from 9am to 12noon. Details. loved your choice Lance, took me back to Sunday night band shows at the Rialto York, that Duke number was always a fave! Sounds good. I missed Free Thinking this year as we were at Words by the Water at Keswick for the weekend. JRR is queued on my iPlayer downloads - looking forward to it. BBC roadies are dismantling the pop-up studio as I type.